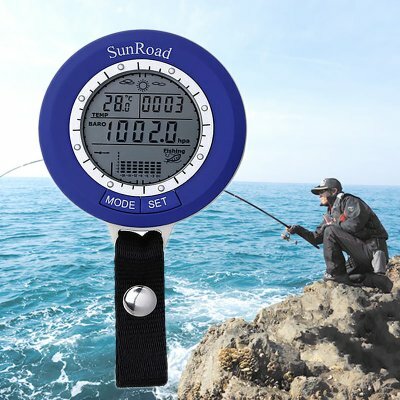 Successfully Added Sunroad SR204 Fishing Barometer - Tracks 6 Locations At Once, Air Pressure, Temperature, Water Depth, Weather Forecast, IPX4 to your Shopping Cart. The Sunroad SR204 fishing barometer is the perfect outdoor gadget for all fishing enthusiasts out there. This cool fishing gadget provides you with real-time data on the environment of 6 different fishing spots at once. Keeping track of the air pressure, temperature, and water depth – this fishing barometer is capable of informing you about the ultimate fishing times. From now on, you’ll always be able to hit the right place at the right time. With the perfect fishing situations at your side, you can be guaranteed that you’ll never return empty-handed from your upcoming fishing trips again. It features an IPX4 waterproof protection rating, so you won’t have to worry about it accidentally getting wet. This outdoor gadget comes with an intergraded barometer, altimeter and thermometer. It furthermore treats you to a weather forecast for the upcoming 24 hours. With its wide range of variables, this outdoor gadget will always provide you with accurate information. Your gizmo is powered by a single CR2032 button battery. This cell puts forth enough power to keep your fishing gadget running for months to come. It also comes with a little hook that allows you to easily attach your gadget to your bag or other gear. Like this, you’ll always have your fishing barometer at your side. With its backlit display, you’ll be able to use your fishing gadget at both day and night. The Sunroad SR204 Fishing Barometer comes with a 12 months warranty, brought to you by the leader in electronic devices as well as wholesale outdoor gadgets..